Special Issue on papers arising from the Second European Conference on Synthetic Biology, at San Feliu de Guixols, Spain 29 March to 3 April 2009. Two communities have been emerging within the realm of contemporary Synthetic Biology, namely a top-down, genetic approach involving knocking out or modifying functions of existing cells, and a bottom-up approach, with a more chemical perspective, interested in the construction of artificial systems from first principles, protocells, also called chells (for chemical cells), etc. With this in mind, the aim of the Second European Conference on Synthetic Biology was to generate new and vigorous interactions between the disciplines that impinge on and contribute to current Synthetic Biology. In this context, the objective was to bring together top-down and bottom-up researchers in a venue whose environment was highly conducive to networking and scientific interactions. Over 90 researchers attended from 18 countries including France, Germany, Israel, Spain, Switzerland, UK, and the USA. This community of top-down and bottom-up synthetic biologists has since come together for other activities under the auspices of the SynBioNT network (www.synbiont.net). The programme comprised 26 invited lectures and 12 short contributed talks with topics ranging over DNA sequencing and synthesis, designing and engineering chemical and biological networks, computational techniques for synthetic biology, minimal genomes and minimal cells, evolution (natural, directed and simulated), origins of life, biological systems, cell cycles and circuits, applications to medicine and computational infrastructures for synthetic biology. There were also tutorials on genetic tools, computational tools and societal aspects, posters and a session on the support for the development of European Synthetic Biology. The conference website is www.esf.org/index.php?id=5386. In order to preserve some snapshot of the current state of the field, we are publishing this Special Issue comprising a selection of scientific articles by speakers at the conference. We hope that these articles will act at least as a partial record of the current state of Synthetic Biology, with a definite European perspective. This view celebrates Synthetic Biology as both a fresh and exciting follow up of decades of work in Molecular Biology, Bioengineering and Computer Science applied to Biology, and as an stimulating new discipline. After all, paraphrasing Isaac Newton, Synthetic Biology can only attain its ambitious goals by standing on the shoulders of giants! We briefly summarise below the various papers. 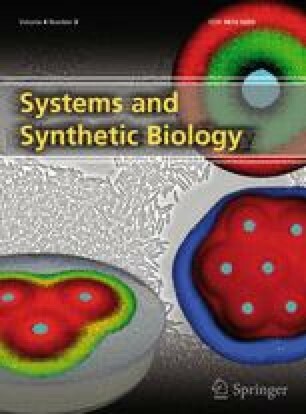 In “Synthetic biology of minimal living cells: primitive cell models and semi-synthetic cells” P. Stano provides an account of the key latest development in bottom-up and middle-out synthetic biology. He positions current research activities within the theoretical framework of autopoiesis and then describes how the research on chemical cells has progressed over the last decade or so. In particular he focuses on minimal semi-synthetic cell, namely, man-made vesicles-based systems that have the minimum number of genes, proteins and other biochemical armamentarium but that can still be considered alive. Stano argues that not only could Synthetic Biology provide enormous opportunities for the engineering sciences and their concomitant practical applications but also that Synthetic Biology is at a strategic crossroad that could help us understand foundational issues related to the origins of life, its functioning and future evolution. Thus the author places this emerging science on a strong basic science footing. Smaldon et al. in “A Computational Study of Liposome Logic: Towards Cellular Computing From the Bottom Up” propose that, in a manner similar to the use in top-down synthetic biology of engineered transcriptional networks for the implementation of logic gates, clocks, oscillators, etc., bottom-up SB could also benefit from a computational approach to building life ab initio and thus help understanding the capabilities and limitations of fundamental mechanisms in protocells. The authors provide a series of computational tools to facilitate this type of studies. For example, they provide a formal language based on P systems to specify the computations to be carried out within liposomes. These model specifications can then be executed using either a stochastic simulation algorithm or a dissipative particle dynamics algorithm. Model selection and analysis, in turn, can be done using model checking. The authors also discuss wet lab implementations for some of the proposed liposome logic circuits. “Variable production windows for porcine trypsinogen employing synthetic inducible promoter variants in Pichia pastoris” by C. Ruth et al., describes a synthetic biology route to the optimisation of porcine trypsinogen protein expression controllability in Pichia pastoris. More specifically, the authors demonstrate how a deletion variant of methanolinducible AOX1 promoter and a small synthetic promoter enable differently regulated target protein expression and also the replacement of methanol induction, which is toxic and flammable, by a glucose or glycerol feeding strategy. Protein titer increased up to 135%. This work is a good example of a simple synthetic biology route, namely judicious promoter engineering, to defeat the limitations of other natural tools for recombinant protein production. In 1994, E.A. Bayer introduced the concept of designer cellulosomes that relied on utilizing cohesins and dockerins of divergent specificities, with the view to charting a route for the controlled in vitro incorporation of a given enzyme into an artificial cellulosome. Although initially designer cellulosomes were mainly used for studying structure and function, it soon became clear that they could represent critical stepping stones in industrial applications, e.g., in biofuel production. In “Thermobifida fusca exoglucanase Cel6B is incompatible with the cellulosomal mode in contrast to endoglucanase Cel6A” J. Caspi and co-authors’ give an account of several binary and ternary chimerical designer cellulosomes, based on modified free enzymes from T. fusca. Their work shows that several of the designer cellulosome exhibited a basic substrate-targeting effect and were efficiently adapted for cellulosomal activity. A “negative” example is also provided whereby another enzyme was shown to work better as a free enzyme rather than within a cellulosome complex. The authors conclude that although cellulosomes have modular architecture, each new combination must be carefully assayed in order to ascertain their ability to operate better as a complex rather than as free enzymes. In “Engineering a novel self-powering electrochemical biosensor”, X. Gu et al., provide a detailed account of the Glasgow’s team participation in iGEM 2007. For a period of 10 weeks during the summer an interdisciplinary team of undergraduates specified, designed, modeled and implemented a self-powered biosensor. This new device coupled a microbial fuel-cell to a biosensor that could convert a pollution signal, e.g. toluene, into an easily measurable reporter signal, e.g. Pyocyanin. The team used deterministic and stochastic modelling for calculating the control map of the device and proposed in silico two potential circuits for implementing the device, one with feedback and one without feedback. Due to time constraints only the later was implemented in vivo. The team contributed ten new biobricks to the MIT repository and detailed SBML models were made publicly available. D. Raab et al’s paper “The GeneOptimizer Algorithm: Using a sliding window approach to cope with the vast sequence space in multiparameter DNA sequence optimization”, gives an account of a new algorithm for the optimal design of de novo gene sequences. The input to the algorithm is an amino acid sequence and a series of constraints and penalties that the DNA sequence coding for the input protein must fulfil. The algorithm performs an incremental partial exhaustive search, in contrast to existing stochastic algorithms, over the space of synonymous codons and selects the coding that maximises the objective function. The later comprises weighted sum of terms, given by the end-user, that include features such as optimal codon usage, the inclusion (e.g. bar codes) or exclusion (e.g. restriction enzymes binding sites) of specific DNA motifs, GC content management (including tracking peaks of low/high GC repetitions), avoidance of high repetitions or inverse repetitions that could create hairpin loops and homology to reference sequences, thus for example avoiding wild type viral sequences when manufacturing a vaccine. The authors have made the software available through a free web-based application. In “Processing DNA Molecules as Text” U. Shabi et al. describe a technology for the design and synthesis of single and double stranded DNA. Their work is based on a novel DNA manipulation operation, called the Y operation, that takes as input two dsDNA molecules A & B and produces the dsDNA molecule AB. It is noteworthy that the Y operation has as output the same “type” as its inputs and hence it can be applied recursively; as a result combinatorial libraries of DNA molecules are more readily defined and manufactured than with conventional approaches, e.g. PCR amplification, cloning or de novo synthesis. The advantages of the approach demonstrated in the paper are that defining de novo or quasi de novo combinatorial libraries with the Y operation is relatively easy, the synthesis costs are substantially reduced as are the error rates obtained in the end products. We hope that still timid newcomers to the field will be intrigued by the type of questions at stake in this special issue and that they will be inspired to become full members of our Syn Bio community. For those already in, we trust they will acquire new ideas and hints for action on the basis of the many new avenues of research presented in these papers. All in all, our role as Editors has been an enjoyable endeavour, and we thank P.K. Dhar and R. Weiss, Editors in Chief of SSBJ, for having trusted us—despite some frustrating delays—for the mission of putting together this special issue. Finally, we would like to thank the organising committee chairs Sibylle Gaisser and Markus Schmidt, and the European Science Foundation for their generous support and help with the organisation.